I do try when I visit places even for work to get a feel of the place, the people, the culture, the architecture and the history. The initial plan included a visit to Lion Park, where you can see lions roam free. It probably would have been interesting, but pictures of people in caged trucks thrilled at watching nature was a role-reversal I would better watch on National Geographic than participate in – I declined the offer of doing that. Now, wildlife conservation is more than commendable, it is necessary and essential to ensuring that the footprints we leave in the sands of time are one of the record that we left this earth a better place than we found it. There is no doubt that parks like Lion Park need custom and will trade on our fascination to continue doing the exemplary work they do. My history and somewhat cultural lesson came from a ride with my hostess on the Johannesburg Red City Tour bus, between history, story, anecdote, fact and legend, a city built on the discovery of gold and diamonds could have dazzled with the glimmer and glitter of gemstones blinding us to a deeper reality that still defines a lot of what South Africa still is. There was no better place to scratch beneath the gleam than at the Apartheid Museum where to give an idea of the colour bar in the Apartheid times I was given a ‘random’ classification of “Nie-Blankes” or “Non-Whites” and was by that designation supposed to enter the museum complex through the gate meant for non-Whites. 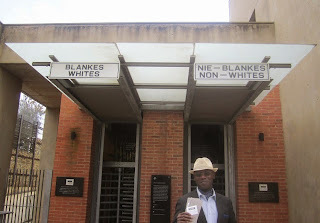 At the non-Whites entrance of the Apartheid Museum. The absurdity of this whole arrangement became evident when you realise that whilst I am non-White, I am definitely European. To think there were times in Africa where people not historically indigenous to Africa treated Africans as sub-human on African soil, just cuts to heart with great pain. The fact that this Apartheid regime was put in place by seemingly enlightened, educated and intelligent people just goes to show that certain elements of basic human instinct are defined by the utterly irrational to the point of risible ridiculousness. Yet, fellow human-beings were subjugated, denigrated, oppressed and dehumanised in ways too unimaginable to countenance. At the stroke of a pen, within the Apartheid framework, you could be racially reclassified for purposes of convenience except the extreme of white becoming black or black becoming white. People who changed race in this many were known as chameleons. The Chameleons of South Africa at the Apartheid Museum. Prominent within the museum were exhibitions of people who transcended this vile aberration of humanity, whose lives we must study as examples of the graciousness and accommodating qualities of the human spirit. Nelson Mandela and Desmond Tutu – there are few people who can stand in stature and meaning close to these men in humility, reasonableness and compassion. We must be careful never to lose the reality of history and the lessons thereof for the easy talk and ignorance of dismissing the significance of history to our present and future. I still see the scars left by Apartheid in contemporary South African society and I am afraid, I see no men in leadership doing much to lift the majority from the mental enslavement that remains the in the wake of the Apartheid rule that was abolished 21 years ago.